NBC 6's Angie Lassman tells us what nations should expect in the coming days, including Puerto Rico as they continue to rebuild following Maria. While the nation continues its long road to recovery following the devastation of Hurricane Maria, Puerto Rico could be in store for more heavy rain in the coming days. A low pressure system in the Caribbean Sea is expected to make its way toward the island and other nations in the area in the coming days. 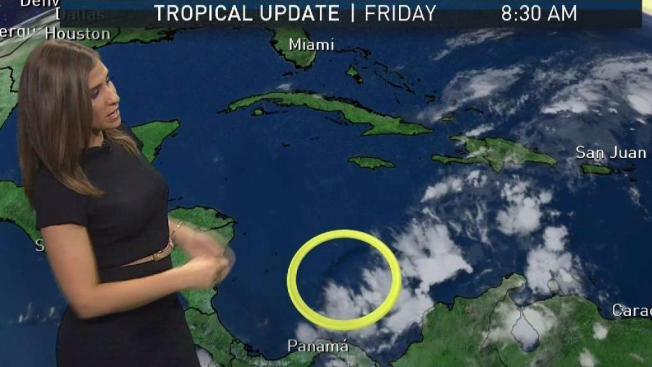 While there is currently just a 20 percent chance to system will develop into a named storm, heavy rainfall between one and three inches and high winds are possible within the next five days. Heavy rains are also expected to produce between three and five inches of waterfall in the Dominican Republic and Haiti. The latest news comes as Puerto Rico could face more than a decade of further economic stagnation and a steep drop in population as a result of Hurricane Maria, experts said on Thursday. The stark estimates were presented to members of a federal control board overseeing finances of a U.S. territory that is already in the 11th year of a recession. "The situation is dire to say the least with destroyed infrastructure, lack of power and water and an accelerated pace of migration," economist Heidie Calero said. She estimated that the hurricane caused $115 billion in damage, even without counting business losses. "We believe that is very conservative," she said. The administration of Gov. Ricardo Rossello said earlier this week that it was seeking $94 billion in federal aid for an island where power generation remains at 40 percent and where nearly 10 percent of people are still without water almost two months after the storm. More than 20 of Puerto Rico's 78 municipalities remain completely without power. So far, U.S. Congress has approved nearly $5 billion in aid for Puerto Rico. Economist Juan Lara told board members that the local economy could contract anywhere between 8 percent and 15 percent in fiscal year 2018, depending on the restoration of power, with overall revenues falling by 30 percent. "We are undergoing both a demand and supply shock," he said, saying that some 5,000 businesses could close permanently, representing 10 percent of membership of the island's National Retail Federation. Businesses that have reopened have been forced to reduce their hours or depend on costly generators. "We need electric power to be back and to be reliable," Lara said. "We need roads to be cleared. We need supermarkets to be able to replenish their inventories.... We need to restore basic operating infrastructure." Lack of power remains the biggest obstacle, with the island's electric company struggling to maintain the 50 percent power generation it had reached on Wednesday just as a major blackout occurred for the second time in a week. Rossello has said the company would reach 80 percent generation by end of November and 95 percent by mid-December, goals that many have called ambitious. In contrast, the U.S. Corps of Engineers has said it expects 75 percent generation by end of January. Before Hurricane Maria hit, Puerto Rico was trying to restructure a portion of its $73 billion public debt load amid a deep economic crisis that has prompted an exodus of nearly half a million people in the past decade. That migration will only accelerate because of post-hurricane conditions, with an estimated population of 2.8 million people by 2030, compared with the current 3.4 million, said economist Jose Villamil. "What Maria has done in some ways is to exacerbate that situation, made it more intense," he said. The drop in population, coupled with a majority of young, talented people leaving, will hit Puerto Rico's economy even harder, experts said. Two more meetings remain as the board continues to gather information to revise a fiscal plan to adjust for the hurricane's impact. It is unclear how much money, if any, will be set aside in the plan to pay off the island's debt load.